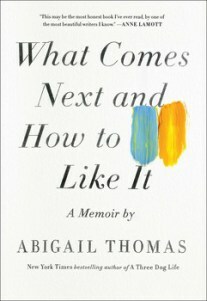 My review of Abigail Thomas’ What Comes Next and How to Like It, for Brevity. I first read Abigail Thomas’ Safekeeping as a new mother, my belly still plump, my babies still purple, and my world still so vulnerable and tenuous. In Thomas’ beautiful memoir, I found someone who understood these things, the difficulties of becoming someone’s mother and someone’s wife, while still unsure of your very self. Safekeeping was the right book at the right time for me in so many ways, and with Thomas’ new memoir, What Comes Next and How to Like It, I found that same understanding and reassurance at-once again-the exact right moment.